That it should be Madame de Maintenon who should take the place as Louis XIV's second wife has baffled people for centuries. Louis XIV could take his choice amongst the most beautiful women at his court and had for years enjoyed the famed beauty of Madame de Montespan. In comparison, it was not Madame de Maintenon's looks that attracted the greatest attention but rather her strict sense of religion. Still, the Françoise d'Aubigné was not exactly ugly either. The Duc de Saint-Simon guesses that she must have been beautiful in her youth - despite not knowing her then. However, in the years he did "know" her he mentions more her mental capacities rather than her physical ones. One person who did know her at the time was Madame de Scudéry. She has left us a rather good description of her friend at the time. According to Scudéry, Françoise was "tall (although others disagreed), smooth beautiful skin, light chestnut hair, a well-shaped nose, a clean-cut mouth ... and the finest eyes in the world". Her eyes were generally considered to be one of her greater features. The portraits of Françoise reveal dark, sparkling eyes - they appear to have been a slightly more elongated almond-shape. Even Elizabeth-Charlotte of the Palatinate - Madame de Maintenon's great enemy - admitted that the royal mistress possessed very fine eyes. Françoise's hair was a deep chestnut; it took a remarkably long time for it to start greying. However, it is interesting that her hair appears to have become a deeper brown over the years. The "light chestnut" of Madame de Scudéry had become a good deal darker by the time she was married to Louis XIV. Her figure, too, was considered "full" - that is it was the ideal of the age. At that time a woman's body was considered to be most beautiful when it was curvy or voluptuous. Madame de Maintenon knew that overindulging could result in her body becoming a bit too "voluptuous". That had happened often enough to her predecessor and the diet of Versailles made it hard to maintain the weight considered beautiful. 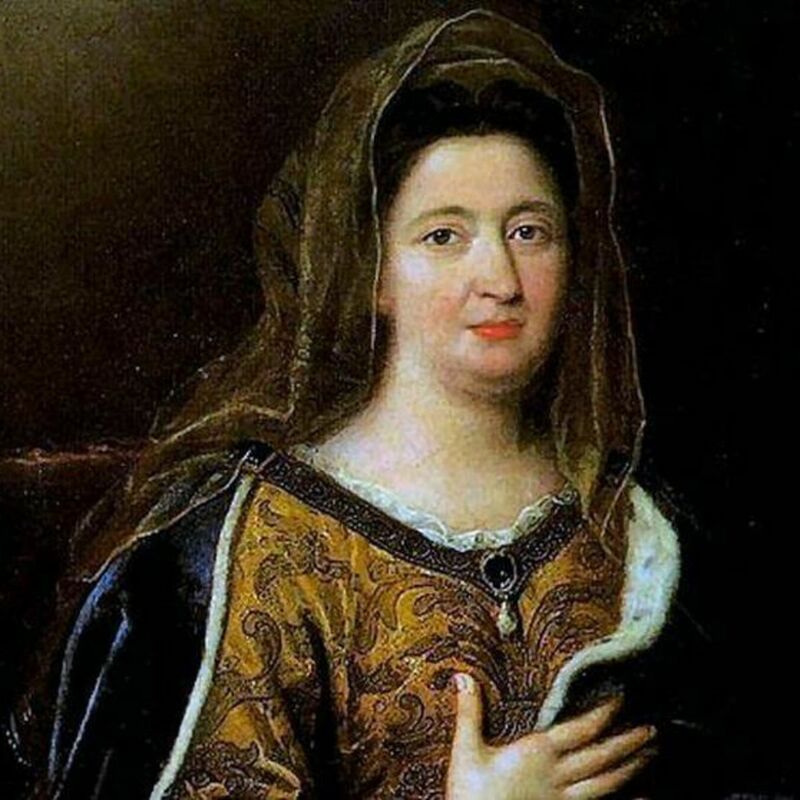 Madame de Maintenon's cheeks were described as a bit "too fat" but still with the appropriate glow. Madame de Motteville described her as a bit too short and her teeth were not very good. However, she noted that the king's last maitresse had a remarkably good complexion. Pearly white skin with no obvious scars from either smallpox or acne. The darkness of her eyes - described by Madame de Montespan and others as "black" - contrasted greatly with the whiteness of her skin; the result was that they seemed very deep. In comparison to the rosy mouth of Montespan, Madame de Maintenon had a rather slim upper lip and an unfortunate tendency to purse her lips - apparently this was especially the case when she met someone whom she did not like. As for her nose, one source described her nostrils as "extended" but otherwise well-made. Her way of dressing was different than her predecessor in that she preferred simpler garments but of the richest material available. This often gave the impression that her style was more modest without her having to give up any comfort.